When panel space is at a premium, the compact SL30 nav/comm transceiver and SL40 comm fit a lot of capability in a surprisingly small package. 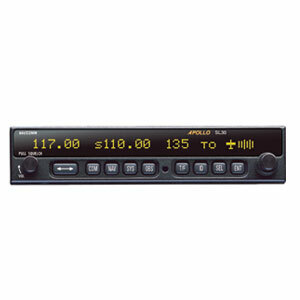 SL30 packs a 760-channel VHF comm transceiver and 200-channel VOR/LOC/GS nav receiver with DME display into one small space. Besides traditional nav/comm features, SL30 also incorporates workload-reducing functions such as automatic decoding of the Morse code station identifier for VOR/LOC/ILS, most-used frequency storage in unit memory, built-in course deviation indicator and more. SL30 is the only panel-mount nav/comm with a standby frequency monitoring feature providing the capability of two nav/comms in one. With the primary VOR/LOC frequency providing guidance to your HSI or CDI, the standby frequency can be tuned to a second VOR to display the current radial on which your aircraft is flying. This allows you to cross check position fixes with just one receiver.